The average age at which gross motor, fine motor and social skills are acquired is outlined below. Slight movements in rotation of the head + lateral flexion of the trunk when trying to move the head, gesture, stare at the mother. Very active in frontal plane. Hands in Ulnar Deviation although in 2 months Thumb is not included any more in the hand. Remain more asymmetric and extension lying in the plain, not very active. Raises head less than 45°, pushes the floor with the fists trying to lift head against gravity and against the resistance of spinal and hip that remain in flexion. On cheek, hands, forearms and upper chest. Baby uses the extension of upper trunk from an asymmetrical position to raise the head, uses upward gaze (eye extension) to assist the spinal extension. Eyes play a significant role in postural control. Shoulders in protraction, arms close to the body, elbows behind shoulders and in flexion. TACR and MORO decreased or disappear. Head control and maintains in midline. Coordination between; hands-mouth, hand-hand and feet-feet these are up of the plane of support. Chin tuck, selective movement of rotation, not deviations in trunk or shoulders. Cervical vertebrae elongate and dissociate. Scapulas in ADD, shoulders in 120 of FLEX, elbows 90º, hands open (not ulnar deviation). Symmetrically distributed on forearms (epitroclea and hands) and abdomen. Shoulders abducted, elbows in line with shoulders, forearm support on immature extended arm support. At the end of 3 months elbows in 90º of FLEX and in front of shoulders. Beginning to gain range of lumbar extension because of the activity and alignment of the upper limb. Hips abducted and externally rotated, knees semi- flex. Strong synergy between flexor and extensor muscles of the neck, chin in more retraction. Begins gripping feature, can hold an object but loose it by chance. Good lateral weight transfer, symmetry enables coordination between both sides. Important manipulative strategies in supine. Touches knees with hands, choosing to do it both hands at the same time or independence one from the other. Chin tucked and chest elevated. Flexion and extension of knees, may play with feet together, lateral weight shift to wrap with the opposite hand. The infant may also push backward in this position. Weight on hands, lower abdomen and thighs. Triangle base of support between nape elbow and thigh and face knee. Uses this base of support to liberate the face arm and wrap a toy with more stability. Eyes-feet-hands coordination, rolls from supine to prone. Movement initiated by shoulder, pelvis or head. Lateral head righting when the baby reaches to the lateral side. Base support arm is in 90° of FLEX, slight EXT ROT, elbow in flexion and pronation, hand open. Oscillate arm shoulder in ABD, elbow in semi-flexion and pronation, hand open. Scapulas dissociated: one has weight bearing functions and the other a basic movement to grasp a toy. Elongated on weight bearing side. Dissociation of the hemipelvises start when the baby reaches the lateral side. The rolling starts with triple flexion and finishes with legs in extension. Swimming posture. Active weight shift to one side and grasp with the other hand. Weight on one forearm or open hands, and distal thigh. Movements in arms and legs, lateral trunk flexion. Child use both arms and legs to pivot. In the 8th month is when all structures, bones and muscles, are prepared for the child can sit. You can download the Centers for Disease Control and Prevention 9 Month Milestone Checklist here. Pulling with the arms can stand starting from a kneeling position. Will remain standing only a few seconds. While motor milestones are undoubtably a useful way of monitoring a childs' development, it must be remembered that each child is different and will achieve the various milestones at different rates. There is a wide window for achievement of these milestones, during which achievement of the milestone is still considered to be in line with normal development. A study published by the World Health Organisation in 2006 demonstrates just this. This study recorded the variations in milestone achievement in 816 children and generated windows during which achievements of these milestones is considered to be normal development, these are outlined in the table above. It should also be noted that this study found that 4.3% of participants never exhibited the hands and knees crawling milestone. The primitive reflexes are movement patterns that can be involuntarily elicited in a newborn. They exist to enhance chances of survival. These reflexes should be integrated as the child's motor development matures. The persistence of these reflexes beyond the usual ages of integration is suggestive of ischemic brain injury. Below several of the primitive reflexes, their appearance and integration dates are discussed. The rooting reflex can be elicited by gently stroking the child's cheek. The reflex is intact if the child's response is to attempt to bring the object to their mouth. This is demonstrated in the video below. This reflex can be elicited by stimulating the palmar surface of the child's hand. The reflex is intact if the child reflexively grasps the object stimulating the palm. Both this and the plantar grasp reflex are seen in the next video clip. This reflex is elicited by stimulating the plantar aspect of the child's foot, just below the toes. The reflex is intact if this cuases toe flexion. The Moro reflex is typically elicited by rapid extension of the child's neck. However it can also occur in response to loud noises. The reflex is intact if the child symetrically and simultaneously abducts and extends the upper limbs, and extends the trunk. The upper limbs then immediately adduct. This reflex is demonstrated in the clip below. This reflex is elicited by turning the child's head to one side. A normal response is seen if the baby's extensor tone increases on the side the head is facing, and flexor tone increases on the opposite side. This is demonstrated in the clip below. ↑ 1.0 1.1 1.2 Piper MC. Motor Assessment of the Developing Infant. WB Saunders Company; 1994. ↑ 2.0 2.1 Stamer MH. Posture and movement of the child with cerebral palsy. 2015. ↑ 22.0 22.1 Bly L. Motor skills acquisition in the first year: An illustrated guide to normal development. ed. 1. Great Britain: Elsevier Science & Technology books, 1998. ↑ 23.0 23.1 23.2 Sheridan M. D. Sharma A. and Cockerill H. From birth to five years. ed. 3. London: Routledge, 2008. ↑ 24.0 24.1 WHO Multicentre Growth Reference Study Group. 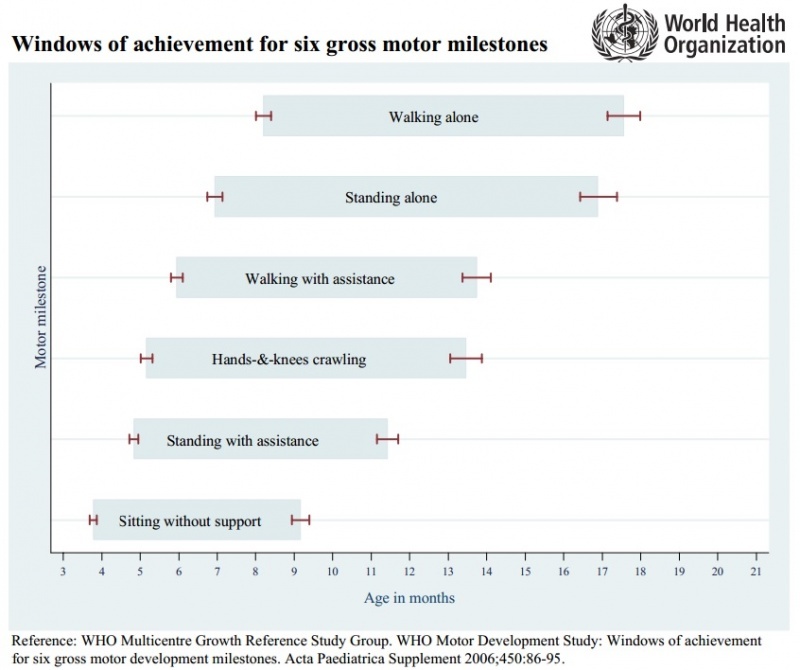 ‘WHO Motor Development Study: Windows of achievement for six gross motor milestones’. Acta Paediatrica. 2006: Suppl 450; 86-95. ↑ 27.0 27.1 27.2 27.3 Votroubek W. 2009. Pediatric Home Care for Nurses: A Family-Centred Approach. Ed. 3. Sudbury: Jones and Bartlett Pblishers Inc.